Did Your Ancestor’s Widow Marry a Veteran? 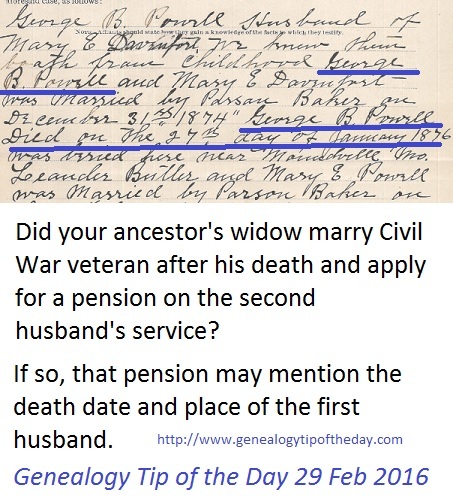 If after your ancestor died and his widow later married a Civil War veteran, her pension application may mention that first husband and provide information on him. This application for Mary Butler gives the date of her first marriage and the date and burial place of her first husband’s death in 1876–before that state kept marriage records. We are offering a new section of this popular course beginning in March of 2016. There are more details on our informational page. Did Your Ancestor Understand the Question? Most of us have asked someone a question or said something to someone only to have their response to us make it clear that they did not understand what we said. Is that why your relative gave “off-the-wall” answers to the census taker, records clerk, etc.? A person’s difficulty in understanding the question can be compounded by age, hearing difficulties, cognitive abilities, native language, etc. Do not assume that your relative really understood what they were being asked. In the attempt to “prove everything,” some genealogists assume Grandma was wrong about everything she said. The reality is that the truth sometimes rests in between. My own Grandma insisted she “remembered” her baptism. I never argued about it, but people raised in the Lutheran or similar faiths typically are baptized as infants. That makes remembering difficult. When I located the record of Grandma’s baptism, it turned out she could have remembered it. She and two of her siblings were all baptized on the same day when she was five. The minister even came to their home to perform the ceremony. If your relative’s last name is a word that is easily translated (such as a color or an occupation), is it possible that some records refer to him by that translated version of his name? Was your ancestor with the last name of White actually a German with a different original such as Weiß? Was your ancestor with the last name of Baker actually a Spaniard with the last name of Panadero? Individuals who immigrated to the United States as minors were subject to a slightly different (shorter) naturalization process than those who immigrated as adults. As a result these naturalizations were sometimes filed separately from “adult naturalizations” in a separate book. 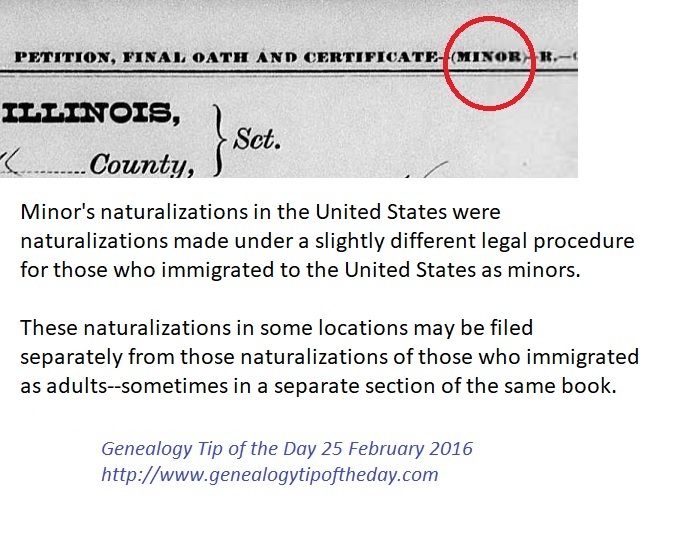 In some counties, the minor naturalizations may be filed in a separate part of the book that contains the “normal” naturalizations. Individuals under the age of majority could not naturalize of their own accord.That’s not the way “minor” naturalization should be interpreted. The first full week of March is Spring Break here and we’ve decided to take advantage of the opportunity and roll out a series of webinar presentations. All attendance is done virtually–you just have to be at your computer. Those who cannot attend live will receive complimentary copies of the presentation. Handout included. Join us! Enrollment is limited. Registration deadline is 8:00 am central time on 5 March 2016. 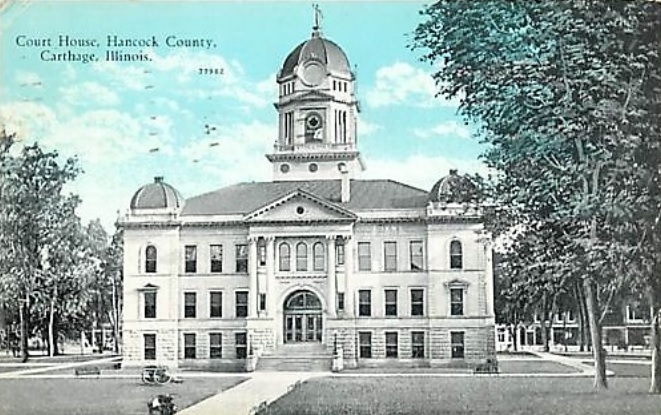 Geared towards advanced beginners and intermediate researchers, this presentation focuses on local Illinois records and recordkeeping procedures, what makes Illinois different, and larger statewide facilities. Have you considered what will happen to your genealogical material when you have gone to meet your ancestors? Preserving your information is more than simply putting a clause in your will and telling your kids to “keep it” or “give it to the library.” We will talk about donation concerns, preserving bits and pieces instead of one big chunk, and more. Learn how to get more out of pre-1850 United States census records than tallies and hash marks. Through a series of several examples, we will see how to construct a probable household structure from these enumerations that only enumerate by name the heads of household. You won’t be ignoring pre-1850 censuses after our presentation. Searching online databases is more than simply putting a name in query box and hoping. In this presentation we will see how to determine a search’s structure and how to create effective searches in such a way that repeatedly searching for similar things is avoided. If you spend more than a couple of minutes searching for a person in a database, it’s time to stop and think about how to organize your search of that database. This presentation will help you to do that. FamilySearch has thousands of online databases that genealogists can use. Some have images and some do not. Some are fully indexed and some are not. Sometimes it’s best to search all their databases at once and sometimes it’s best to break your search down into specific regions or databases. After a general search procedure overview, we look at several representative examples from a variety of time periods and locations. Solving genealogical problems requires applying some organization and methodology to the search process—not just searching willy-nilly to see what can be found. 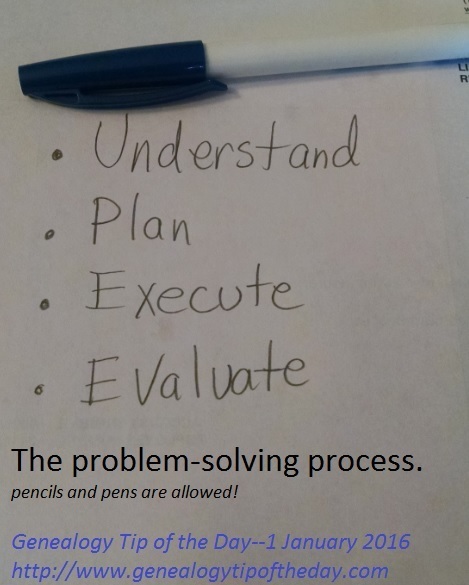 We will look at an overview of one problem-solving approach (more than just what’s on the illustration) that helps to focus the researcher on any genealogical problem and the various components of that process. Then will we see the process applied to several problems. We’re not guaranteeing to solve all your problems, but to give you ideas to help you direct your search. Always remain open to the possibility that an initial letter could be dropped when written in a record or document. 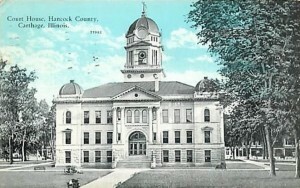 Courthouse record copies of land deeds, wills, and similar documents can easily contain the occasional error. 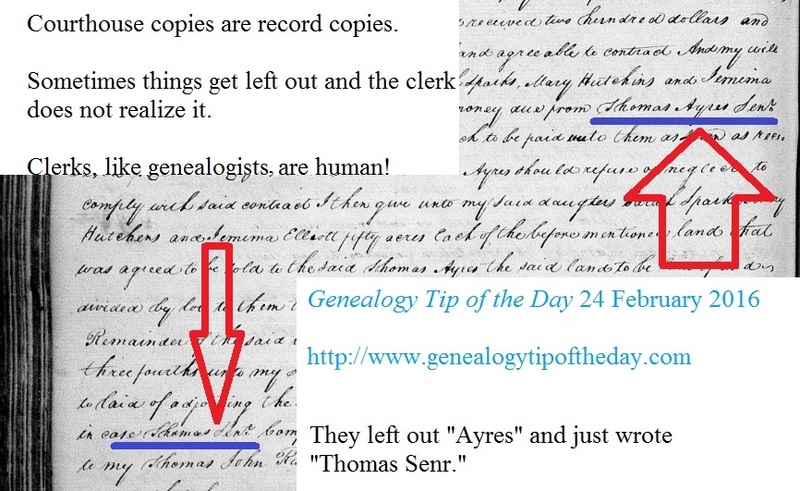 This is particularly true from items recorded in the days when these copies were handwritten by a clerk. Sometimes the error is of little consequence and sometimes it is. The record copy of this 1812 will from Harford County, Maryland, leaves out the last name of the man to whom the testator has sold some property. Record copies are usually considered to be the legal equivalent of the original document. That does not mean they are error-free.